Terrence Malick's acclaimed film starring Brad Pitt is now over fifty percent off at Amazon! 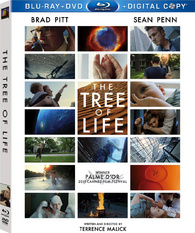 The online retailer is now selling 'The Tree of Life' for $14.99 (57% off suggested list price). Through stunning cinematography and raw emotional power Malick’s hymn to life excavates answers to the most haunting and personal human questions through a kaleidoscope of the intimate and the cosmic, from the raw emotions of a family in a small Texas town to the wildest, infinite edges of space and time, from a boy’s loss of innocence to a man’s transforming encounters with awe, wonder and transcendence. Click here to add this highly recommended film to your collection!